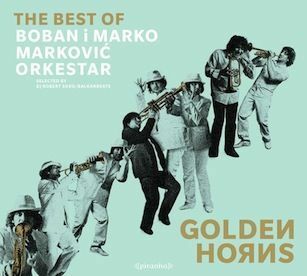 In the ranks of the current wave of Balkanic brass orchestras two or three bands reign supreme on the European dancefloors - and one of those is indisputably the Boban i Marko Markovic Orkestar from Serbia. 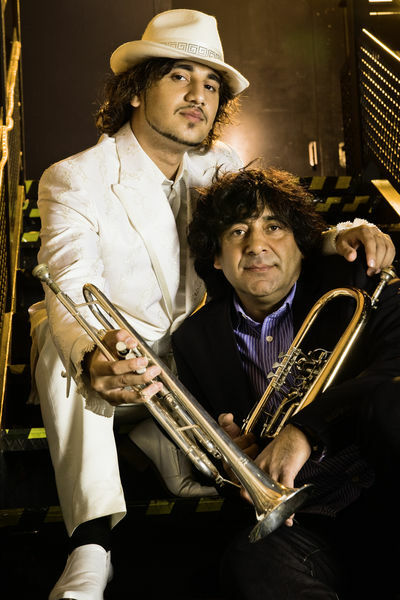 "dancefloor mayhem wherever they go"
The Roma father and son trumpeters, vocalists and bandleaders, Boban and Marko are legendary in Balkan circles and have won so many prizes they’ve agreed to stop competing in the music festivals to give other people a chance . . . The band itself is one huge well-oiled, super-tuned machine that constantly tours the world and creates dancefloor mayhem wherever they go. Besides which, their albums are so popular that you can go almost anywhere in Europe from the Arctic Circle to the Straits of Gibraltar and from Ireland to Turkey and if there’s a Balkan music night then you can guarantee people will be dancing to the hits of the Markovic clan. 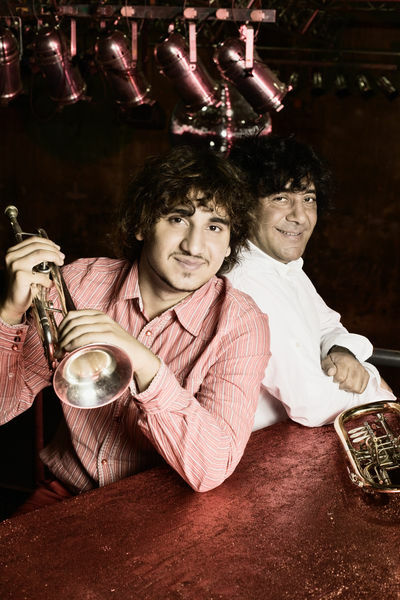 In fact their music has been so successful (along with the likes of the Mahala Rai Banda, Goran Bregovic, Taraf de Haidouks, Fanfare Ciocarlia, Kocani Orkestar, etc) that they seem to have spawned a whole sub-industry on Soundcloud with every permutation of treatment you could imagine, many of them sampled to a digital pulp by remixers and mashers all over the world. Testament really to great music, a fabulous sound and amazing musicianship. So if you want to know what the fuss is all about, then “Golden Horns” (released on the Piranha label on 11 June 2012) is as good a way of finding out as any. This 15 track CD is essentially a ‘Best Of’ compilation, a sort of mid-point retrospective of their career so far. It’s packed with their international hits such as “Khelipe E Cheasa” (love this one! ), “Od Srca”, “Cinnamon Girl”, “Rromano Bijav”, “D�umbus Funk”, “Hava Naguila”, “SAT”, “Ederlezi” and “Mundo Cocek”. "irresistible bass lines hardwired to your feet"
It’s not all superfast stuff - it’s made to dance to for people of all ages, so there’s plenty of mid-tempo groovers with irresistible bass lines hardwired to your feet (eg “Sina Nari”, “Voz”, ”Šljivovica” and “Khelipe E Cheasa”) - and the slowest tracks, “SAT” and “Ederlezi” easily hold their own too. Even if you don’t recognise the track names I’ve mentioned, you’re likely to instantly recognise the melodies and wild, syncopated brass figures. There are also two remixes at the end. The first, and probably the most well-known since it seems to have crossed over into kitsch-pop almost electroswing territory, is “Cinnamon Girl” here presented in it’s most well-known form as a remix by the successful German remixer, Ulf Lindemann, aka ‘[dunkelbunt]’. The second is “Go Marko Go” - a remix by DJ Robert Soko. 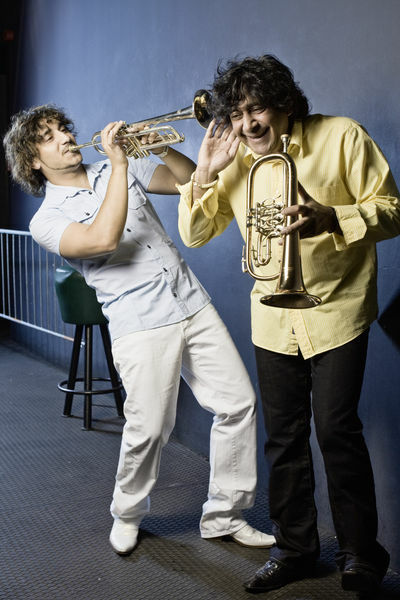 If you’ve never come across Balkan Brass music before then buckle up your belt, undo the top button on your shirt and jam your hat down hard on your head, because you’re going on a musical rollercoaster! "imagine an elephant in a tutu and a ballerina in hobnailed boots"
With five flugelhorns/trumpets, four tenor horns, three percussionists, reeds and a large helicon pumping out the bass lines, this is a huge sound: imagine an elephant in a tutu and a ballerina in hobnailed boots doing a dance together - then this would be the music for it. Trust me, you won’t be able to resist! "superfast massed brass lines, spitting out red-hot fire - true balkanic eruption"
The combined effect of superfast massed brass lines, spitting out red-hot fire in a true balkanic eruption, crazy percussion, and a rocking rhythm that doesn’t allow you to sit still for a second is something to be experienced. "buy this album, close the curtains ... and whack the volume up to 10!" If you can’t see these guys live, then get down to your nearest Balkan DJ night - or failing that buy this album, close the curtains (so the neighbours can’t see), remove all breakables from the mantlepiece and whack the volume up to 10! Forget radio’s so-called ‘Dance’ music - Boban i Marko Markovic Orkestar is the real deal!